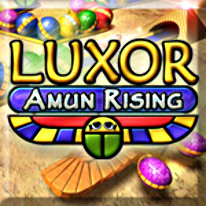 Glorious adventures await as you return to save Ancient Egypt from certain doom in Luxor: Amun Rising. You must defeat the rebellious Princes of Megiddo before they overthrow the Pharaoh and plunge the Two Lands into chaos! The powers of Isis are at your command, including explosive Fireballs, thundering Lightning Bolts, and the new Scorpion Power-up, which calls forth a magical scorpion from the Pyramids to destroy up to the first ten spheres it encounters. Eliminating an entire chain of spheres will destroy the scarab minion that pushes them and release the sparkling Bonus Gem hidden within. Enjoy the breathtaking original music score and thrill to the electrifying sound effects. Filled with excitement, adventure, and intense action, there is only one question you must ask yourself: Can you drive back the rebellious invading forces and once again save Egypt?